Features cushion padding and an interior scratch-resistant tricot lining to protect your camera and accessories. A front zippered pocket holds batteries, cables and other accessories while two side stretch-net pockets hold memory cards and more! Use the metal D-rings to use as a shoulder sling or carry the bag on your belt with attached nylon belt loop. Works with Sony DSCW800/ Canon 111C012BA SX610/ Nikon Coolpix S5300/ PowerLead Pcam PDC001/ Panasonic Lumix/ Olympus Stylus SH-2 , 1 , XZ-2 , XZ-10 , VG-160 , Tough TG-4 , Tough TG-850 iHs and many other compact cameras! The QCD’s weather resistant neoprene exterior protects your device while keeping a sleek and professional look. Covered zippers and neoprene materials allow the case to repel moisture , dirt , dust , sand and snow. Take the case to the next level of protection with the included rain cover which wraps around the case and can be used with the shoulder strap or belt loop. The neoprene material offers impact resistant cushion padding for your device. The interior features a scratch-resistant tricot lining to keep your camera looking like new. The multiple pockets are built to hold batteries, cables, memory cards and other small accessories. All the hardware on the QCD is made from metal , no plastic zippers or buckles here. The included adjustable shoulder strap is easily connected to the metal D-rings on the case. Includes 3 Year Manufacturer’s Warranty. 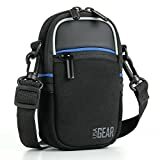 This entry was posted in Discount Photography and tagged Camera, Case, Compact, Coolpix, Cover, Digital, Gear, Lumix, Nikon, Panasonic, PowerLead, Rain, Shoulder, Sling, Sony by Ball Photo. Bookmark the permalink.